In a week full of General Manager hirings in the NWHL, the Boston Pride will retain their GM from the 2015-16 season. 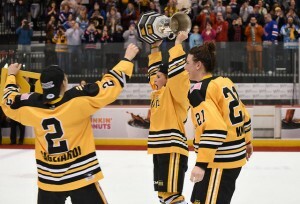 Hayley Moore returning as GM of the Boston Pride is an auspicious first step for the Isobel Cup champions to build on the success of their first season. The Boston Pride had quite the successful 2015-16 season. They finished the regular season with the best record in the league and then went on to win the first ever Isobel Cup in the finals. The Pride played in the first ever women’s Winter Classic tying the CWHL’s Les Canadiennes, 1-1. After the success of the inaugural season, we look to continue our momentum and carry on the winning traditions of Boston’s professional sports teams. From 2009-10 Moore was a volunteer assistant for the UMass-Boston women’s hockey team. She helped coach them to a successful 17-10 record. She would then go on to lead St. Mark’s school to a 12-12-1 record during the 2011-12 season. Harvard had the pleasure of having Moore as their assistant coach from 2012-14. While there Harvard was ranked number 2 in the national, earned a bid to the NCAA tournament, and helped the team earn an Ivy League Championship. Currently, Moore is the Director of Girl’s/Women’s hockey for the East Coast Wizards. Moore started her career out at Brown (2004-08) where she captained the team Junior and Senior year. Upon graduation she was placed among the top ten all-time leading scorers at Brown with 133 points. During the 2010-11 season, Moore played 26 games for the Boston Blades (CWHL) scoring 9 goals and 5 assists. She was ranked 7th on the team in scoring. Moore also played a season in Switzerland.